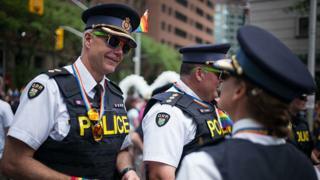 New York police are wading into the heated debate over police participation in Toronto's pride parade. The Gay Officers Action League (Goal) has invited Toronto police officers to march, in uniform, during New York City's Pride March. Police uniforms were banned from Pride Toronto, after outcry from the Black Lives Matter movement. The controversial ban has raised the ire of many police groups, but has caught on in other Canadian cities. The New York City Pride March is on the same day as the Toronto parade. Toronto's police union said it hopes many officers will be able to participate. "We are honoured that they have invited Toronto police officers to attend and march in their parade with uniforms," Mike McCormack, president of the Toronto Police Association, told the BBC. Image caption Black Lives Matter was the honoured guest at Toronto Pride, where it protested police presence. Members of Pride Toronto voted to ban police uniforms, weapons and vehicles from the parade earlier this year, after protests from Black Lives Matter. Police are allowed to participate as members of the community. A spokesperson from Pride Toronto declined to comment on GOAL's invitation to Toronto police officers. The decision has proved divisive within the LGBTQ community and the city at large. Toronto Pride said the ban was necessary in order to include communities who feel marginalised by police. But the Toronto Police Association has been vocally opposed to the ban, even going so far as to ask the city to pull funding from Toronto Pride, which the city declined to do. "This type of restriction is a step backwards for both our gay officers and the relationship Toronto Police have tried to build with the community," Mr McCormack said. About 10,000 people have signed a petition on Change.org asking for uniformed police to be allowed to march in the parade. Marching in uniform is an important part of any pride parade, said GOAL's executive director William Shephard. "We actually had to sue in the United States federal court in 1997 for the right to march in the NYPD uniforms in New York City Pride," Mr Shephard told the Toronto Star.